Pennsylvania ranks fourth in the nation for deer-related collisions, according to a 2015 report, trailing West Virginia, Montana and Iowa. Last year, nearly 3,500 deer vehicle collisions occurred in Pennsylvania, with nine deaths caused by those who hit a deer. But these numbers do not include the large number of people who swerve to avoid the deer and instead hit an embankment, tree or utility pole, which results in more than 24,000 collisions and more than 400 deaths — and that doesn’t include the number of people who collide with traffic in the oncoming lane or whose vehicles roll over. That’s why it’s imperative to not leave your lane of travel, even if you hit a deer. It’s predicted 1 in 70 Pennsylvanians will hit a deer during the next 12 months, with those odds doubling in October, November and December, during deer mating and hunting season. Another point of consideration in addition to your own safety: If you hit a deer, the insurance claim will usually be paid by the comprehensive coverage of your car insurance policy. Comprehensive claims, such as one for hitting a deer, do not typically increase your car insurance rates. However, if you swerve to avoid contact with the deer and end up running into another vehicle or object (such as a tree or guardrail), the collision portion of your policy will apply. Keep your eyes on the road, but scan your surroundings. 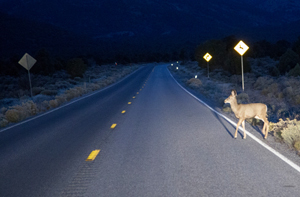 At night, look for the deer’s eyes, which will shine when reflecting your car’s headlights. Use your high beams, when possible. If you see one deer cross the road, look for others behind it. Often, deer travel in small groups. Be especially cautious during dusk and sunrise, when deer are most active, and at night, when it’s difficult to see deer approaching the road. Slow down and drive defensively, especially through agricultural and forested areas. Don’t rely on deer crossing signs as deer may make a split-second decision to cross anywhere. Maintain your vehicle — having well-maintained tires and brakes will help you to stop in the shortest amount of time possible. If you or someone you know has been involved in a deer vehicle collision and has questions regarding insurance coverage, call on the KBG team for help. We’re here 24/7 to get the Results You Deserve®.